I love cooking in the crock pot once it starts turning cool. there is something about the lingering smell of the food all day long. 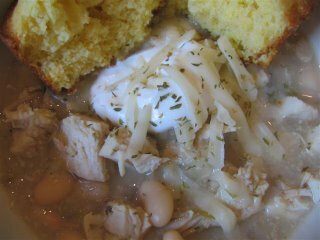 i made this delicious chicken chili. mix chicken broth, onion, green chilis, cumin, oregano, salt, and cayenne pepper in the crockpot. add the chicken on top. cover and cook on low for about 4-5 hours. remove the tender chicken breasts and cut into cubes. return the chicken to the crockpot. add beans, lemon juice, and corn starch. (i used the corn starch to thicken it up a little, be sure to mix it with a little cold water before adding it to the chili) cook on low until everything is hot. when it is done sprinkle with monterrey jack cheese and sour cream. we had this with cornbread muffins. 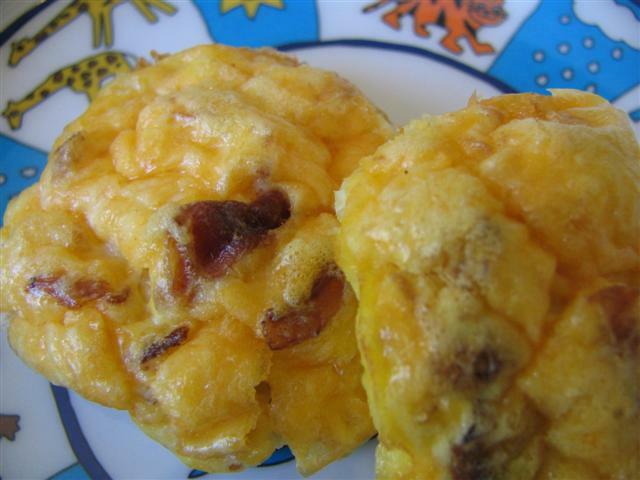 i got the recipe for the squash from the south beach gourmet on a south beach forum. i have a link to her blog. mix all together and press into a pizza pan. i used a 9X9. bake at 375 for about 15-20 minutes. let cool and top with toppings. bake again until cheese is melted. 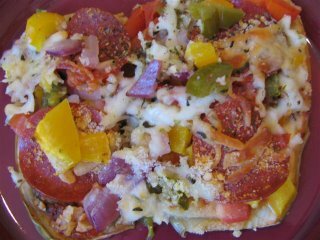 i topped mine with sugar free pizza sauce, onions, tomatoes, bell peppers, tvp, jalapenos, shredded mozzerella and parmesan cheese. it was very good. 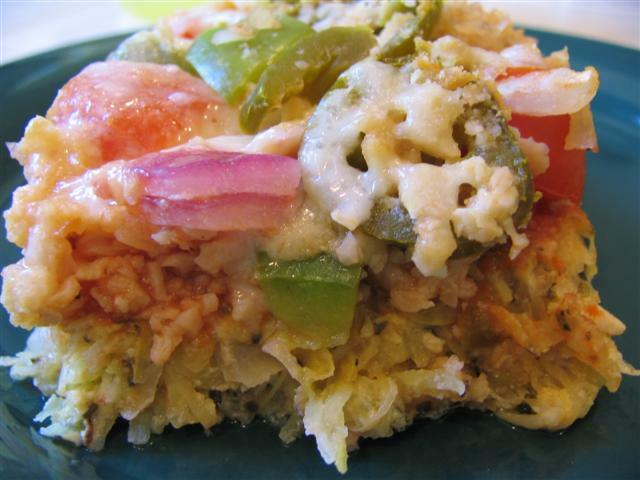 my son liked it too, minus the jalapenos. *bake it: pierce the whole shell several times with a large fork and place in a baking dish. cook squash in a preheated oven at 375. cook for about 1 hour or until flesh is tender. *boil it: heat a pot of water large enough to hold the whole squash. when water is boiling, place the squash in the pot for about 25-30 minutes, depending on its size. when a fork easily goes in to the flesh, the squash is done. *microwave it: cut squash in half lengthwise; remove seeds. place squash cut sides up in a microwave dish with 1/4 cup water. cover with plastic wrap and cook on high for 10-12 minutes, depending on size of squash. add more cooking time if necessary. let stand covered for 5 minutes. after the squash is cooked by whichever method, remove the seeds and strands with a fork. i was in the mood for a good stir fry. i bought an excellent vegan stir fry sauce and had to try it out. saute the cabbage, onions, bell pepper, celery, and garlic in a little olive oil. 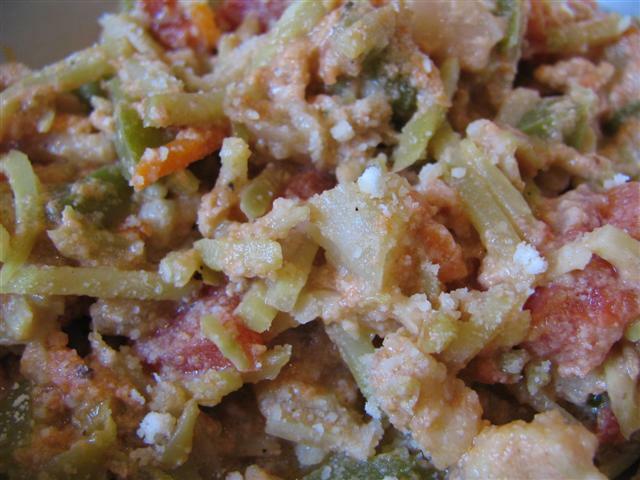 (if using real chicken cook it and dice it separately) add in the chicken pieces when all veggies are tender. add in the tomatoes and then the sauce. i just sauteed it until it was all pretty tender. 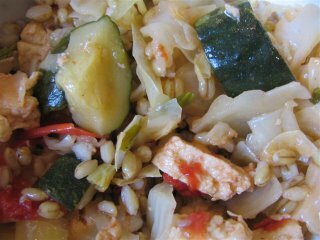 i added a little barley to mine, you could always add brown rice after cooking. so, we went to the farmer's market and they had some beautiful fresh veggies and fruits. i picked up apples, peaches, bell peppers, white eggplant, tomatoes, and zucchini. then i came home and decided to make some eggplant pizza slices. i really like grilled eggplant, but this is probably my favorite way to eat eggplant. i sliced my eggplant lengthwise. mine were pretty small so it made between 5-6 slices per eggplant. if it is a large eggplant, i usually slice it in half first. bake them in the oven for about 15 minutes at 400, to get them a little tender. spray the pan really good to avoid sticking. i also sprinkled a little salt and pepper on them. take them out of the oven and flip them over. spread pizza sauce, add chopped bell pepper, onion, jalapenos, tomato, meat, and pepperoni. top with the mozzerella cheese and sprinkle with parmesan. then sprinkle the italian seasoning on top. bake for another 15-20 minutes or until the cheese is melted. cut the potatoes. 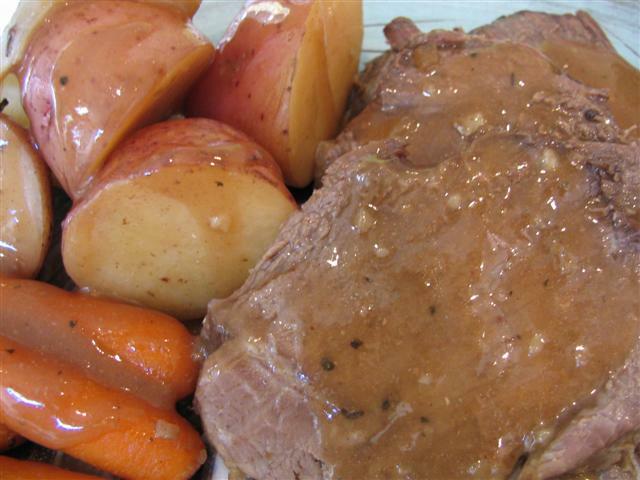 put the carrots, potatoes, and onions into the crockpot. put the roast on top of the veggies. mix the onion soup mix into the cans of beef broth. pour the broth and mushroom soup over the top of the roast. cook for 6-8 hours on low. after it is cooked. take the roast and veggies out. save the broth. add 2 tbsp flour to the broth to thicken it up a little and top it over the roast and veggies. gotta luv'em. these are so good. i like to make mine a little crispy around the edges. 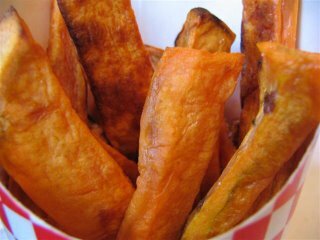 i usually peel my sweet potatoes and cut them up like fries. i microwave them piled in a bowl for about 4 minutes just to get them a little tender. i toss them with a little olive oil and sea salt. then line them up on a cookie sheet and bake them for about 45 minutes or until they look crispy. i usually turn them half way through. bake them at 425. these are also good sprinkled with cinnamon!!! 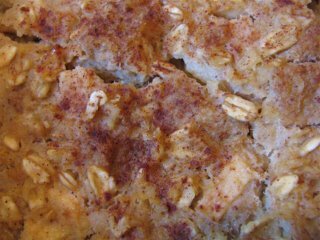 i remember when i was younger, one of my friend's grandmother made the BEST bread pudding. it was so delicious probably filled with white bread, sugar, whole milk and butter. but, it sure was good. 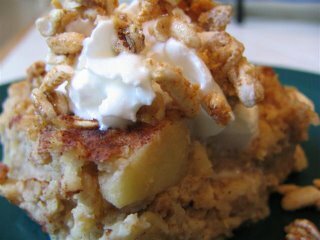 i have made bread pudding a couple of times but not recently so i decided i would make up a batch with healthier alternatives. i have used bananas before and it was yummy, but this time my fruit of choice was the apple. i will have to make the banana bread pudding again and take photos. i was inspired to do this recipe by gretchen the kitchen goddess. check out her blog in my links. i think i will also try her chocolate chip bread pudding because it looks and sounds wonderful. she has some very good recipes on her blog. 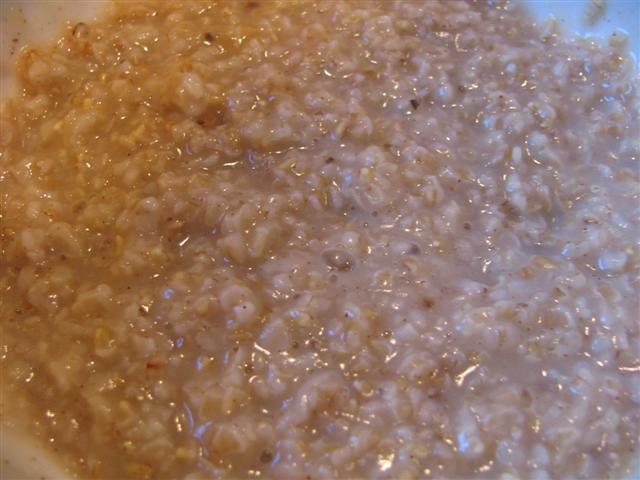 in one bowl, mix together cubed bread, oats, soymilk, egg whites, cinnamon. let this sit for 25 minutes while you are getting the apples ready. in another bowl add the diced apples, honey, maple syrup, vanilla, and apple pie spice. mix together. add the apple mixture to the bread mixture. mix well. pour into a sprayed baking dish. sprinkle cinnamon on top. bake at 350 for about 40 minutes. you want to bake until the top is golden brown and the center is done. this can be served warm or cold. keep it in the refrigerator. i put a dollup of whip cream on top and sprinkled with a little homemade granola. it was spectacular!! prepacked veggies are so quick and easy to use. for this i used both the broccoli shreds (these are great with ranch on top too.) and cauliflower. in this dish i used one of my favorite spices, cumin. it has such a great smoky flavor, but not hot. excellent in this dish. saute the bell pepper, onion, and garlic in about a tablespoon of olive oil. saute until tender. stir in the remaining ingredients. simmer on medium heat for about 5 minutes. 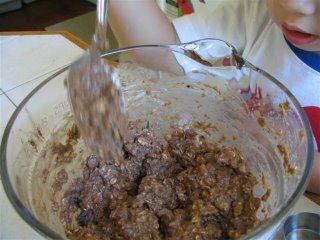 transfer mixture to a baking dish that is sprayed with cooking spray. bake at 350 for about 40 minutes. stirring halfway through. the cumin in this dish is what truly makes the dish wonderful. mmmm....caulfilower. it is good mashed, baked, and especially fresh. today, i made it baked with a little Mrs. Dash sprinkled on top. i used a bag of fresh cauliflower. 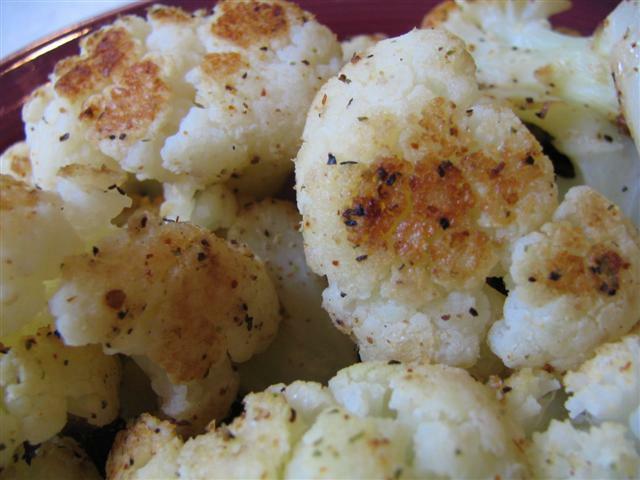 toss the cauliflower with Mrs. Dash table blend (i am sure any of the others would taste great too. i like Mrs. Dash because it combines some great spices together without adding salt.) i used a pinch of salt and pepper. also used a little olive oil to avoid sticking. i baked it at 350 for about 30-40 min. take it out when the cauliflower starts turning a golden brown. fresh veggies are the best. i needed to add some to my breakfast meal so i just scrambled it all up. 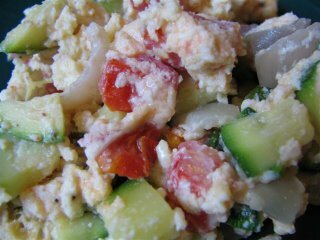 mix together and scramble like you would scrambled eggs. after you scramble sprinkle a little parmesan cheese on top. this makes enough for leftovers. just reheat and eat. yummy and quick!! these were very good. my son really loves them and he likes mixing it up in the bowl too. they are very filling. my son really likes these. 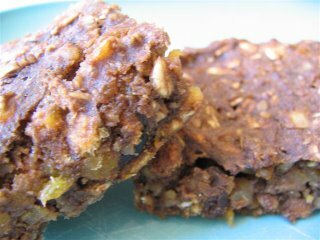 they are simple to make and my husband enjoyed them too. whisk the egg whites and whole eggs together, add in the crumbled bacon and cheese. (make sure the bacon is cooled off before adding it in) pour into muffin pans about 2/3 full. bake at 350 degrees for 20-25 minutes or until top turns golden brown. my husband liked these on a whole wheat english muffin. my breakfast this morning was inspired by a great friend of mine, laurie. i made a cup of honey vanilla chamomile tea and then added the tea to the oatmeal. 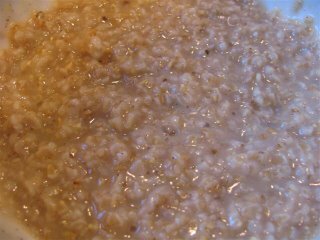 i used steel cut oats and cooked them in the microwave. it had a hint of honey and vanilla. i also added a dash of cinnamon. great combination. i think i will experiment with other tea flavors. i really like grilled salmon, but it was raining and i decided to cook it in the oven. it turned out very nice. 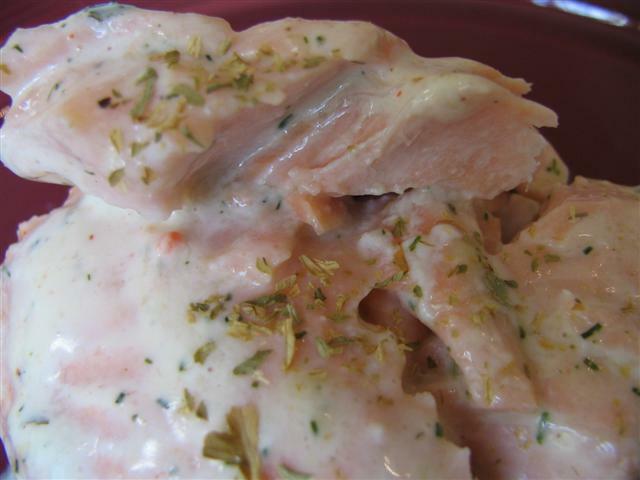 great flavor with the lemon dill sauce. i used frozen wild salmon fillets. preheat oven to 425 and cook brushed with a little olive oil for 20 minutes. i like them grilled better, but this way was good too. for the sauce, i used 1/4 cup sour cream, 1/4 cup plain yogurt, 1 1/2 tbsp dijon mustard, 1 tbsp lemon juice and 2 tsp fresh dill chopped. whisk this sauce together and top it on the salmon when they are finished. 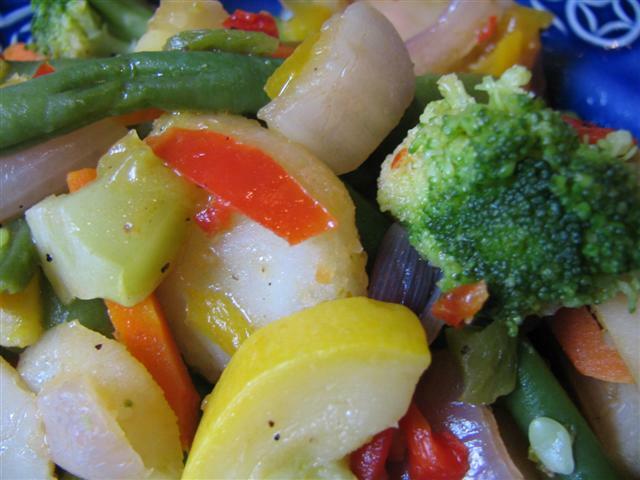 veggies are a staple. you must have them. i eat veggies in many different ways. today i made a stir-fry with a mixture of fresh and frozen veggies. then i sauteed fresh chopped purple onions, fresh green, red, and yellow peppers, fresh broccoli, yellow squash, green beans, carrots, (frozen)sugar snap peas, and canned water chestnuts in a little extra virgin olive oil. i added a dash of salt, fresh ground black pepper, and garlic powder. this was a delicious mixture and all of the flavors complimented each other quite well. my guacamole is fantastic. 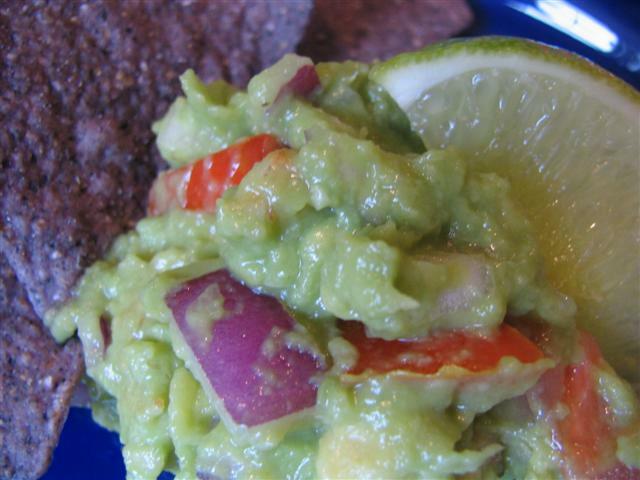 if you like your guacamole a little chunky, then you will love this one. the hint of lime is what seals the deal. i love to eat it with blue corn tortilla chips or rolled up in a corn tortilla. i love all fruits and today i was in a fruity mood. i cut up some star fruit (a combo of flavors, think plum meets lemon meets pineapple) very good and pretty! also cut up some honeydew nectarine and peaches. for the dip, i used 1/2 cup plain yogurt, 1/2 cup whip cream (not in can), lemon juice, and a little lemon zest. 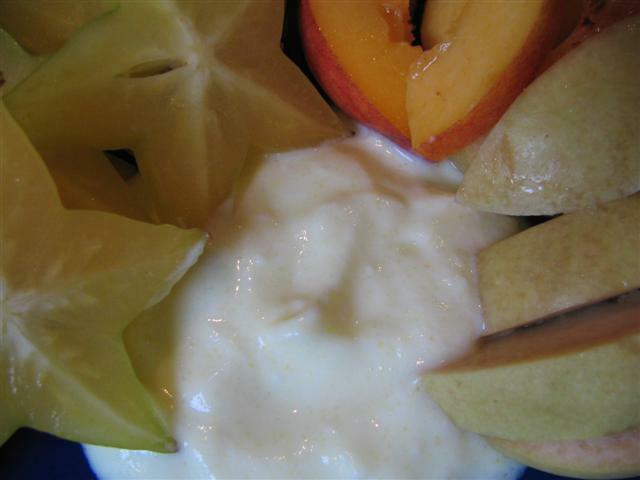 it was a sweet, tangy and delicious dip with the fruit mixture. i am a stay at home mom. cooking is a great hobby. it is fun to create new, interesting, healthy and light meals. my son loves to help. he likes cooking and getting his hands in the food. it is fun for him to see what he has created and then get to eat it.